A convenient place to start your exploration of Ireland's oldest national park, Torc Waterfall offers panoramic views of the region's three interlinked lakes. You can reach the base of the waterfall via a short trail through a densely wooded area, covered in moss and known for attracting herds of native red deer. This waterfall is an important natural landmark on one of the country's major long-distance walks, a 214 km (133 mi) long circular trail that begins and ends in the nearby town of Killarney. You can access this popular trail by ascending a series of steps just to the left of the waterfall. To see the fall at its full glory, visit after a heavy rain. 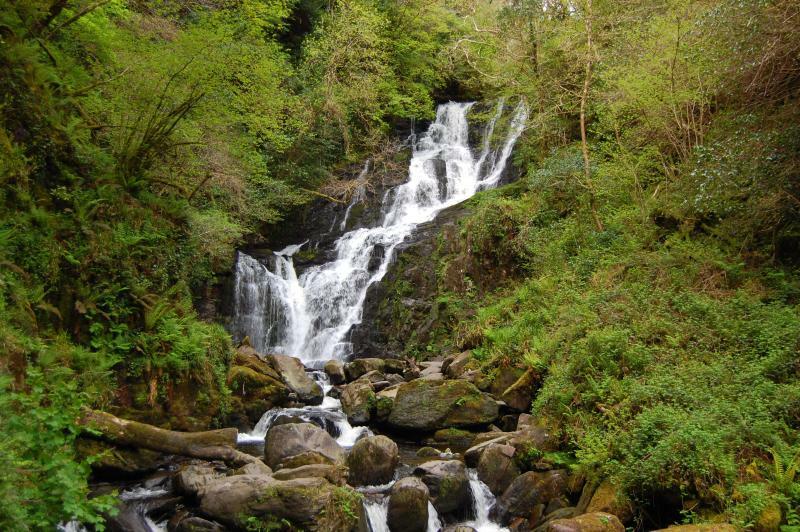 Put Torc Waterfall into our Killarney road trip site to see other points of interest to visit during your vacation in Killarney. Torch Waterfalls were stunningly beautiful and just a short, 5 minute, walk from the car park. However, there is a trail, that is a steep climb to the top but doesn’t actually take you to a better place to view the waterfalls, it just seems to take you around the top of them where you can hear but not see them. Beautiful to look at but not the best attraction in the local area. The walk itself was good exercise though, so if you’re a keep fit fan, this will be enjoyable. I arrived after the visitor center had closed. The sign said 5 minutes walk to waterfalls. Being out of shape with some knee issues, it took me over 8 minutes to walk to the waterfalls. I decided to walk up to the head of the falls and that was another very steep 20 minute walk but the views were amazing. I highly recommend this stop. Although we visited during a period of very little/no rain, the waterfalls we're still quite enjoyable. A short walk from one of at least 2 parking area. You have 3 hikes to choose from: 40 min/moderate, 60 min/moderate, or 2.5 hour strenuous. We for the long hike and they're is a long section that is extremely strenuous - make sure you're up for it before committing. "Straight"up hill for at least an 800' elevation gain! Great views from the top. Nice and well maintained trails. Stunning waterfalls and lush flora. The yellow trail was a welcomed escape from the car. The stairs ended just before getting tough, which led back down to beautiful lakeside scenery. Every day, we help thousands of travelers plan great vacations. Here are some tips on how to use your Listing Page to attract more travelers to your business - Torc Waterfall. Promote your permanent link - https://www.inspirock.com/ireland/killarney/torc-waterfall-a88216627 - on your website, your blog, and social media. When a traveler builds a plan from this page, the itinerary automatically includes Torc Waterfall. This is a great way for travelers looking for a great vacation in your city or country to also experience Torc Waterfall. Promoting your link also lets your audience know that you are featured on a rapidly growing travel site. In addition, the more this page is used, the more we will promote Torc Waterfall to other Inspirock users. For best results, use the customized Trip Planning Widget for Torc Waterfall on your website. It has all the advantages mentioned above, plus users to your site can conveniently access it directly on your site. Visitors to your site will appreciate you offering them help with planning their vacation. Setting this up takes just a few minutes - Click here for instructions.